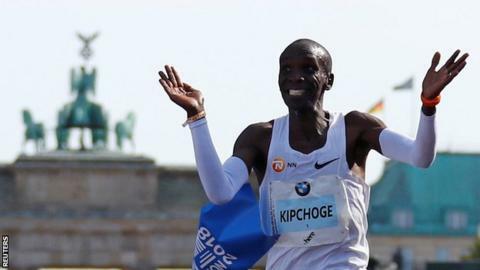 Kenya's Eliud Kipchoge smashed the marathon world record by clocking a time of two hours one minute 39 seconds in Berlin. "It was hard," he said. "I ran my own race, I trusted my trainers, my programme and my coach. That's what pushed me in the last kilometres." The men's marathon record was not the only athletics record to fall on Sunday as France's Kevin Mayer set a new benchmark in the decathlon. His world record of 9,126 points at the Decastar event in Talence, France, surpassed American Ashton Eaton's 9,045 total set at the 2015 World Championships. "I've been waiting for this moment for a long time," said Mayer, 26, the world champion and an Olympic silver medallist in the discipline.